If you like nature and one who like to take jungle walks and enjoy the sights of natural surroundings, then you are in for a treat in Cameron Highlands. This is where you can enjoy the cold air of the highlands while appreciating the amazing and spectacular sights of the rich rainforests of Malaysia. In Cameron Highlands, you must have a good camera to capture some of the most excellent scenes you can ever find. The lush and rich vegetation of Cameron Highlands makes this township one of the top tourist attractions not only within Malaysia but around the region. Here, there are a lot of places to visit that include vegetable farms, strawberry parks, bee farms, tea plantations and many more. If you are the more adventurous type, you can head out to the thick forests and jungles located around Cameron Highlands. There you will find a very fulfilling vacation as you can go camping, visit the waterfalls, hiking on the trails and even exploring into the jungle, among many others. While the most common and more popular activities for tourists here are to visit the tea plantations and vegetable farms, there are several must-see attractions that everyone who comes here should experience. The Mossy Forest in Cameron Highlands is perhaps one of the most underrated attractions here. you will literally be among the clouds that the trees penetrate through. There is a jungle trail here where you can view the rich flora and fauna in their natural habitat which is clouded with mist and fog. Furthermore, you will be able to see some of the most beautiful sights around Gunung Brinchang along the way. This is because most visitors to Cameron usually visit the farms and more commercial places. The Mossy Forest is a great place to refresh and rejuvenate especially for those who like nature. As the name implies, Mossy Forest takes you deep into the jungle where the sight is something to behold and appreciate. It would be an ideal place to visit for those who would like to enjoy the fresh air while being in the midst of some of the most beautiful landscapes around here. 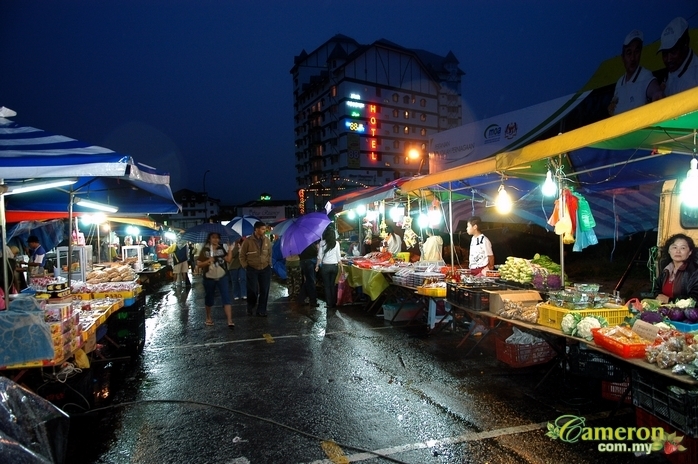 The Pasar Malam or Night Market at Cameron Highlands is located in Brinchang town. It comes alive at night and is one of the most popular places in Cameron Highlands. The Pasar Malam provides the perfect shopping place for those who like to buy some local produce, traditional food stuff and just about any other items needed during your stay here. This is no ordinary Tudor-style boutique resort because the Lakehouse overlooking the scenic lake is an exclusive getaway nestled amidst the natural beauty of Cameron Highlands. This magnifient Mock-Tudor Hotel was built in 1972. Interior furnishings styled after English country house. This idyllic countryside resort atop the majestic mountains makes you feel at home immediately once you step into the lobby area. Even if you are not planning to stay here, do drive up to the Lakehouse and snap some pictures because you won’t be disappointed with its façade and architecture. Beautifully presented Mock-Tudor hotel and restaurant with an amazing lounge area filled with wonderful objects from the British past. Afternoon tea and scones and an original red British phone box standing opposite the hotel completes the picture. First class accommodation and restaurant. Wonderfully scenic tea estate open for visitors to view the factory, tea shop and audio visual center. Located along the Gunung Brinchang road, turn left after the Butterfly Farm near the Copthorn Hotel. If you like to have a bird’s eye view of the tea plantations, then head out to this place. This is where you can enjoy a cup of fresh Cameron Boh Tea at the platform that overlooks the hilly slopes of tea trees. Many flower nurseries can be found alongside the main road from Ringlet all the way to Kampung Raja. Most nurseries allow visitors to view their various varieties. Rose centre and Rose Valley are other great attractions you can’t miss. Great views of the estate from the tea and souvenir shop located around 5km up from Ringlet on the main Tanah Rata road. This plantation is another place where you can enjoy tea and the beautiful hilly landscapes of Cameron Highlands. It is home to the second largest tea producer known as Cameron Valley. The visitor’s centre here is very popular where you can buy all types of tea products and souvenirs. Cameron Highlands 18 hole Golf course allows visitors to enjoy the golf game in comfort away from the heat and humidity at sea level. The course is quite challenging with tricky greens and undulating terrain. Best to play from early in the morning as heavy afternoon rains are quite common. The Time Tunnel Galleria in Cameron Highlands pride itself as the first memorabilia museum in Malaysia. This is where there are a wide variety of antiques and paraphernalia items on display on its special building located at Brinchang town. This page explains what are the items on show, the location and address of the museum and the entrance fee imposed. You can see old photos of historical Cameron Highlands. There are a lot of images and information here which will keep you captivated on how far Cameron Highlands have changed ever since it was discovered many decades ago. There are many interesting jungle walks in Cameron Highlands. Some are just a short gentle stroll and others a half-day stiff trek for the very fit. All are enjoyable and worth venturing on. If you need help to choose the walks best suited to your needs, most hotels and guest houses are very knowledgeable and helpful on the subject. There are a few very popular waterfalls around Cameron Highlands. Locations like Robinsons and Parit Falls are very popular especially for jungle trekkers. You start from the Century Pine Resort and make your way to the waterfalls where you can see a scenic and peaceful pond shrouded with trees and blue skies. Start from the gerdens on Persiaran Dayang Endah and continue to the end of the road. Cross a small bridge on your left to start the walk. There are a number of strawberry farms in Cameron Highlands, the best known are probably Healthy Strawberry farm, Kasimanis and Big Red Strawberry Farm. Always worth a visit for their novelty value and the chance to taste strawberries and cream! The two Butterfly farms are Butterfly Farm and Butterfly Garden both have numerous butterflies and other insects including the well-known Raja Brooke butterfly. A lot of visitors who visited the Healthy Strawberry Farm will tell you that the strawberries here are among the sweetest in Cameron Highlands. The views around the farm are very beautiful where you can take photographs of the beautiful red-coloured plants and the surrounding sights. If you are around Brinchang, visit the Ee Feng Gu Honey Bee farm. This place has a very scenic environment where you can take photographs with the beehives and other items as your backdrop. You can buy some bee and honey products or enjoy the indoor maze here too. If you are looking for a luxurious place to stay with all the facilities and spectacular sights, then the Cameron Highlands Resort is your perfect option. You will be staying within some of the most beautiful sceneries in the whole of Cameron Highlands. This is added with views of the beautiful golf course that spreads far into the horizons. It must be noted though that being a top resort, the rates here are slightly costlier as compared to the others. The Strawberry Park is perhaps one of the most iconic places in Cameron Highlands. Its Tudor-architecture and design has been synonymous with what Cameron Highlands is known for. Housing its own flower garden, you can take very beautiful pictures of the surroundings with the black and white buildings as your backdrop. A playground here is commonly used by children and is opened to public. If you are up for a challenge, then you can take a hike up Gunung Brinchang. Getting to a higher peak from the highlands is both refreshing and truly rewarding. Stay a night at the Crown Imperial Court where you can then plan your hike up the mountains. Along the way, take some beautiful pictures of the rich rainforests and its flowers and plants. Located in the heart of Brinchang town is the Crown Imperial Court. Here, you can have a picturesque view of Cameron Golf Course not far away as well as the town centre of Brinchang from the footsteps of the balcony. Meanwhile, you can see a lot of natural landscapes on certain locations of Crown Imperial Court while you can even see the sunset if you are staying in Block A.